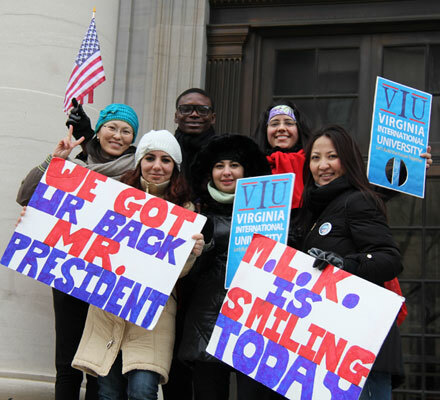 On January 21, 2013, a cold and clear Monday, several VIU students and staff members went to downtown Washington, DC for the inauguration of Barack Obama as the nation’s 44th President. Along with thousands of other people, VIU students and staff cheered, clapped and held up signs stating “We ‘got your back’ Mr. President.” The 57th Presidential inauguration, held on Martin Luther King Jr. Day, was entitled “Faith in America’s Future” to commemorate the United States’ perseverance and unity and marked the 150th year of the placement of the Statue of Freedom atop the Capitol Dome in 1863. For VIU participants, it was an unforgettable experience. “I came to the US for the first time on January 4, 2013. I’ve seen Washington, DC many times in movies and on television; however I never had the opportunity to visit the city before January 21, 2013. It was a historic day as it was the celebration of the 57th Presidential Inauguration and Martin Luther King Jr. Day. It was the first day I walked through the streets of the Capital. I am very glad that our university organizes such events for students, for the knowledge we gain as well as the wonderful experiences. It is great that our Student Affairs Department is very active and enthusiastic to arrange such events. We started our journey in Pender with 6 students at 8:30 am as our coordinator, Ms. Yanisse took the lead and gave us the guidelines of the tour. She gave us many things essential for the tour; bags full of food, hand warmers, water, and fruit, and she also brought extra warm clothes for us to use, which was great! From the Pender Campus we walked to the bus stop, however Ms. Emily and Ms. Shilpa came as angels and gave us a safe ride to the Vienna Metro station. As Yanisse provided us with Smart Trip cards earlier, we easily got into the metro without waiting for anything. We reached Washington, DC at 10:00am, as scheduled, and my feelings were unexplainable. Many gathered and walked towards the Jumbotron. We reached the Jumbotron near the Washington Monument. From there, we were able to see the White House. We were able to enjoy the inauguration ceremony by watching on the Jumbotron. It was a very cold day; however, hand warmers given by Yanisse helped us to keep our hands very warm. When Barack Obama took the oath, at 11:45am, an additional VIU student joined us. We left that place and Yanisse took us to a very nice restaurant. We had lunch and Yanisse even shared her grapes with us! The place was so good and warm that some of us were able to take a quick nap. After that, we tried to see the parade, but there were too many people standing in front of us, so we could not see it from near. However, we enjoyed the waiting to see the parade. It was a very good day. While we were walking towards the metro station to reach Vienna, Yanisse showed us the US Chamber of Commerce and the museums. We talked about planning to come and visit Washington, DC again in the near future. We took another metro at 5:17pm to reach our school. We had fun in the metro; we took many fun pictures there. After reaching the Vienna station we took a CUE bus to reach our school, and the interesting thing is that the hand warmers were still working! We reached our school at about 6:00pm as planned and organized by Yanisse. It was not over for me – Ms. Yanisse dropped me off at home as I it was harder for me to get a bus home.